25in. replacement nitro chopperlump barrels (by the makers in 1929) with matt sight rib, open sights and ramp-mounted bead foresight (missing protector), barrels engraved 'CHARLES LANCASTER - 99 MOUNT STREET, BERKELEY SQUARE, LONDON', treble-grip stepped action with side-clips, carved fences, automatic safety with gold-inlaid 'SAFE' detail, elongated top-strap, Lancaster patent detachable dipped-edge back-action lockplates, engraved 'patent 64311', Rogers patent cocking levers, best bold scroll engraving, the makers name within a cartouche, retaining traces of original colour-hardening, 15in. well-figured pistolgrip stock with cheekpiece, rose gold escutcheon inscribed 'D.F.H. - NOVEMBER 1928', engraved pistolgrip-cap and chequered steel grip-strap, including 1in. rubber recoil pad, fore-end with grip release catch, weight 11lb.7oz., in its lightweight leather case, the lid initialled 'D. F-H'. Provenance: Denys Finch Hatton was born in England on April 24th 1887, the son of Henry Stormont Finch Hatton, Earl of Winchelsea and Anne Finch Hatton (nee Coddrington), a daughter of a former Admiral of the British Fleet. Educated at Eton and Balliol College, Oxford, Denys was a natural sportsman and scholar of the arts. In 1911 the 24 year old Denys bought land in British East Africa as an investment which would give him the freedom to spend his time hunting. He would spend every Autumn and Winter in Africa doing just that. In 1925 he became a professional big game hunter and took numerous wealthy and distinguished clients on safari - including H.R.H. the Duke of Windsor (the then Prince of Wales). His taste for adventure led him to learn to fly, and it was on May 14th 1931 that he died in a fatal plane crash in his Gypsy Moth near what is now the Tsavo National Park, Kenya. He is buried in the Ngong Hills and an obelisk marks his grave to this day. The story of Denys Finch Hatton and his love affair with Karen Blixen (his only known romance) is immortalised by Robert Redford and Meryl Streep in the Academy Award-winning film 'Out Of Africa' (1985). On the death of D F-H the rifle was gifted to his great friend Viscount Cole with whom he'd been best friends at Eton. 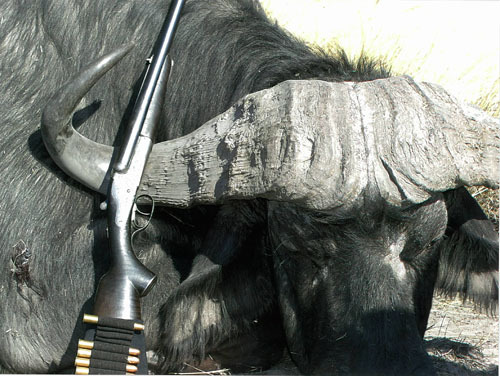 The Cole family purchased an estate in Kenya, where he shot a great deal of buffalo with the rifle. In 1960, ownership passed to the Dawson family for the princely sum of £100.